Peptide (C)DAVLYSGFTLDEAER, corresponding to amino acid residues 241-255 of rat Parathyroid Hormone 1 Receptor (Accession P25961 ). 1st extracellular loop. Homology Mouse - identical; human - 14/15 amino acid residues identical. 1-3. Anti-Parathyroid Hormone 1 Receptor (extracellular) Antibody (#APR-051), (1:200). 4-6. 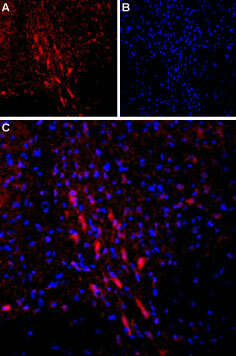 Anti-Parathyroid Hormone 1 Receptor (extracellular) Antibody preincubated with the control peptide antigen. Immunohistochemical staining of rat dorsal Raphe nucleus using Anti-Parathyroid Hormone Receptor 1 (extracellular) Antibody (#APR-051). 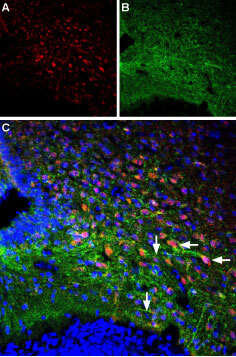 A. PTH1R (red) staining is detected in Raphe neurons (arrows). B. Nucleus staining using DAPI as the counterstain (blue). C. Merged images of A and B. Cell surface detection of Parathyroid Hormone 1 Receptor in intact living rat U-87 MG cells. A. Extracellular staining of cells using Anti Parathyroid Hormone 1 Receptor (extracellular) Antibody (#APR-051), (1:50), (green). B. Merge of A with live view of the cells. Potts, J.T. and Gardella, T.J. (2007) Ann. N.Y. Acad. Sci. 1117, 196. Vilardaga, J.P. et al. (2011) Cell. Mol. Life Sci. 68, 1. Potts, J.T. (2005) J. Endocrinol. 187, 311. Chung, U.I. et al. (1998) Proc. Natl. Acad. Sci. U.S.A. 95, 13030. Vortkamp, A. et al. (1996) Science 273, 613. Mahon, M.J. et al. (2006) Mol. Endocrinol. 20, 136. Singh, A.T. et al. (2005) Endocrinology 146, 2171. Schipani, E. et al. (1995) Science 268, 98. Bastepe, M. et al. (2004) J. Clin. Endocrinol. Metab. 89, 3595. Duchatelet, S. et al. (2005) Hum. Mol. Genet. 14, 1. The parathyroid hormone receptor type 1 (PTHR1) is bound and activated by two peptide hormones: the parathyroid hormone (PTH) secreted by the parathyroid gland and by parathyroid hormone related peptide (PTHrP) which is produced locally in many tissues. Although these two peptides bind the same receptor, they exert different actions. PTH regulates the concentrations of Ca2+, phosphate ions and vitamin D in the blood, stimulates bone formation/resorption and is distributed to the kidneys where it regulates Ca2+ and phosphate transport, and is also detected in the liver1-3. PTHrP, on the other hand, plays a critical role early in development of bone, heart, mammary glands and other tissues, and is detected in the circulation only during lactation and secreted by some tumors1,2,4,5. PTHR1 is obviously localized to all areas and tissues where PTH and PTHrP are known to exert their effects (i.e. bone, kidney, blood, heart, etc.). PTHR1 belongs to the superfamily of G-protein coupled receptors. Like all members, PTHR1 has seven transmembrane spanning domains, an extracellular N-terminus and an intracellular C-terminal tail. Upon activation, the receptor couples to either Gs and Gq thereby activating adenylate cyclase and phospholipase C (PLC) respectively. In osteosarcoma cells, PTHR1 can also couple Gα2,6,7. PTH is being used today to treat osteoporosis, as a factor promoting bone formation. Mutations in PTHR1 are associated with Jansen’s disease (hypercalcemia and dwarfism) and Eiken syndrome (cartilage tumors of bone)2,8-10. Anti-Parathyroid Hormone 1 Receptor (extracellular) Antibody (#APR-051) is a highly specific antibody directed against an epitope of the rat protein. The antibody can be used in western blot, immunohistochemistry, and live cell imaging applications. It has been designed to recognize PTHR1 from human, mouse, and rat samples.